My parents left this morning after a two week visit. While they were here, Paul and I went away for a weekend. It's a win for everyone - we had a break, the boys had time with just their grandparents and the grandparents had time with just the boys. We left late in the afternoon on Friday, as soon as the little guy I babysit was picked up, and drove 7 hours to our destination, which meant most of the driving was done in the dark. Driving across Newfoundland means driving through mostly uninhabited land. During daylight hours, it's a beautiful drive full of ponds, brooks, fields and gorgeous ocean views. In the dark, though, it's not quite so interesting. Beyond the scope of the headlights, it's just darkness, darkness and more darkness. There's nothing to see, even when I know there are gorgeous views right beside us. I said at one point, "It's a shame to drive through this section in the dark!" That night I found that whenever a light appeared in the distance, I immediately turned to see what it was. Most of the time it was just a communication tower with a light on top, but sometimes it was a town in the distance or a spot where I could see a car coming towards us on the road far ahead. Whatever the source, the light drew my attention because it stood out in the darkness. Jesus said to His disciples, "You are the light of the world. A town built on a hill cannot be hidden. Neither do people light a lamp and put it under a bowl. Instead they put it on its stand, and it gives light to everyone in the house. In the same way, let your light shine before others, that they may see your good deeds and glorify your Father in heaven" (Matthew 5:14-16). There is so much to think about in these three verses! First of all, we are the light of the world, because we have Jesus, who said of Himself, "I am the light of the world. Whoever follows me will never walk in darkness, but will have the light of life." Because He is the light of the world, we have the light of life, and so we are now the light of the world. The lights in the distance grabbed my attention when we were driving in the dark. In the same way, our lives should grab the attention of people living in spiritual darkness. Unfortunately, most people don't really like standing out. We'd rather be like everyone else and not draw attention to ourselves. That's not God's plan, though. The lights on those communication towers make the towers visible to aircraft flying at night. They wouldn't serve their purpose if they were covered over. God has given us this light to draw attention to us, not because we are so great, but because He is. Because He offers salvation to everyone who believes, and because He wants "everyone to come to repentance," (2 Peter 3:9), His plan is for believers to grab the attention of those who don't yet believe. But we can't do that if we're covering over our light by living the same as everyone else. Obviously, people in Jesus' day didn't light their lamps and then put them under bowls, for the same reason we don't turn on our lamps and cover them up. But, as believers, we do tend to cover up our spiritual light. When we try to blend in with everyone around us, living as selfishly as the rest of the world, then our light is covered up and we don't attract the attention of others. God wants our lights to shine bright for others to see. Again, it's not because we are worthy of that attention, but because our light draws attention to Him, the source of our light. When our focus is on serving Him, rather than on serving ourselves, people see that we are different. Some will probably just think we're weird, but some will see that our differences, our light, come from our connection to God, and Jesus said that letting people see our light would cause them to glorify God. 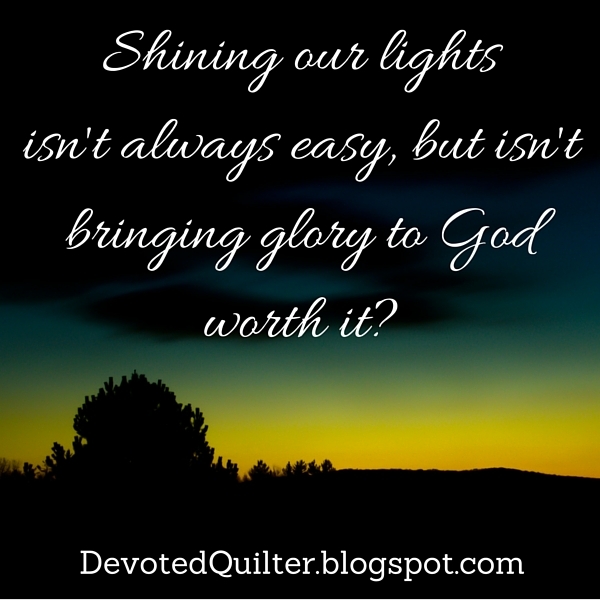 Shining our lights isn't always easy, but isn't bringing glory to God worth it?